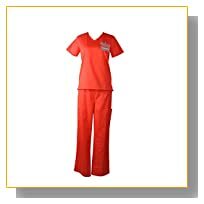 Play a role in the Netflix original series orange is the new black with the prisoner suit costume.Includes: shirt, pants, and nametag. When it’s time to dress up for Halloween, dressing like a character from a favorite show can be a lot of fun. Not to mention eye-catching and prize winning. 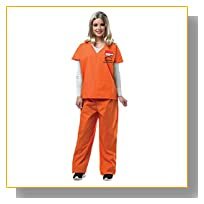 Some of these winning costumes can be found by dressing as the stars from the hit show Orange Is the New Black. Orange Is the New Black. 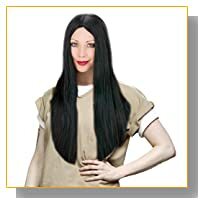 You could also use these costumes if you wanted to go with a group by having each person go as someone from the show.One of the main stars of the show is Piper Chapman. One of the main stars of the show is Piper Chapman. She actually could have two different costumes. The first costume is a pair of orange scrubs. The top is a vee neck with short sleeves and is worn over a white or gray short sleeved t-shirt. To be authentic, you want to make sure that you choose the costume where the top does not have pockets. 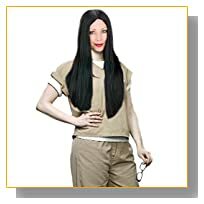 Pockets are not allowed on inmate clothing for safety reasons. You’ll want to get a pair of plain orange or black tennis shoes. 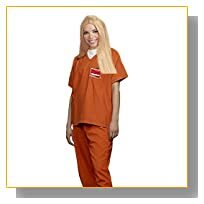 The second set of scrubs that you’ll see Piper wear is a tan set and that’s sometimes paired with a long-sleeved gray t-shirt or a short sleeved white one. In the show, Piper often looks washed out, so you can use make up to enhance the look of bags beneath the eyes. 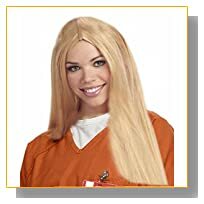 If you choose to go with a blonde wig, you’ll want to get one that’s more of a dirty blonde color. 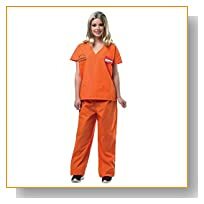 You can also accessorize by using a clip to pin an inmate ID to the front of the scrub top. On the left, there will be a small photo of the person wearing the prison uniform. 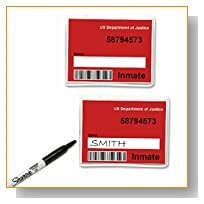 There will be a white space for the “inmate’s” last name followed below by a bar code. 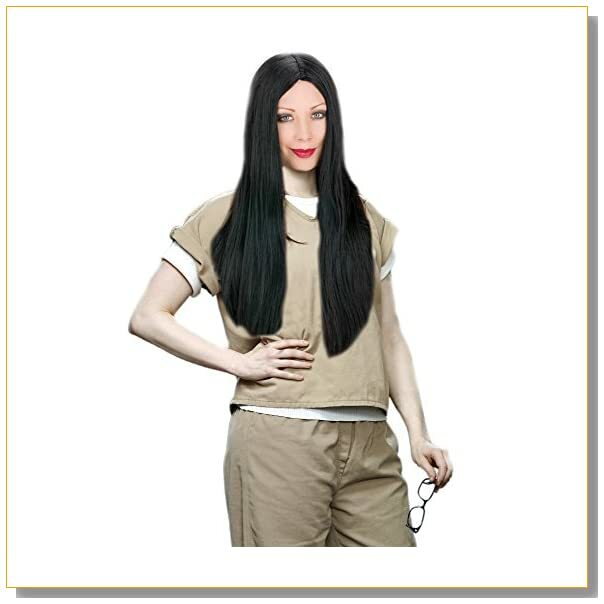 The costume for character Alex Vause is the tan scrubs and same ID. 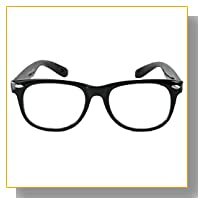 The black, big frame glasses are not included, but you can accessorize with a pair of oversized reading glasses to get that look. She also has a red and green rose tattoo on her right arm as well as another tattoo on the forearm. You can buy those separately or if you know someone with some artistic ability, you can have them draw it on your arm for Halloween night. Miss Claudette Pelage’s costume is a tan scrub set with or without a long sleeved gray t-shirt. 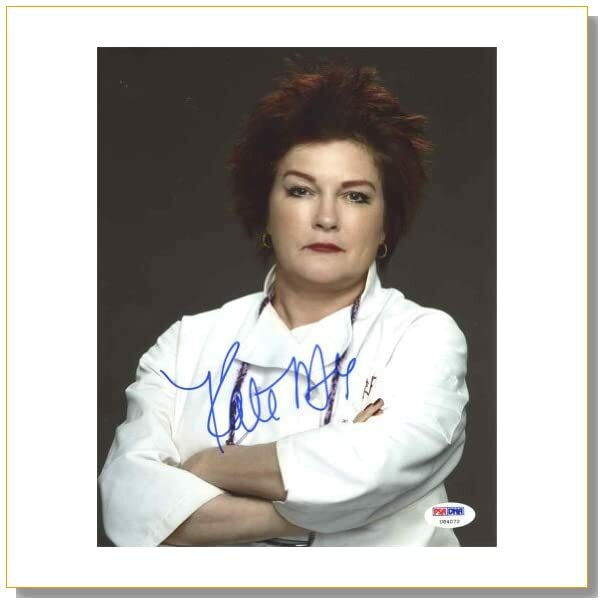 For the costume of Galina ‘Red’ Reznikov, you’ll be decked out in a red wig, glasses with side chains and a white button up shirt that looks like the top of a chef uniform. Make sure that you add bright red lipstick to complete the look.